His name is Karl...if IIRC he is actually Cechz but pretended he was Austrian. I think Lift Co and RMB stopped providing him with free resort entry and lift pass. I don't think Karl is his real name. He told me he was happy for them to call him that but his name was john or peter or something similar. Hello, my father is Russell Rockliff and Julian Brown mentions him a few times in his book Falls Creek: How it Came to be. At some stage he owned the Diana Lodge, possibly the person before your parents did Marg. But he also used to play in a jazz band the Thunderbirds each season prior to owning it. I will upload some slides that I have but we have heaps and i can convert the slides to photos. My friends who have gone in the past come over to show dad what it's like now and there is a dam and a few other things still around that he built. I found a spinet of an old The Age Newspaper from the 8th May 1967. So my favour to ask is, it's my dad's birthday and I would love a copy of any old ads, post cards or anything historical from around 1961 to 1970 that I can give to him as a keep sake and in return i'm happy to send over what I have. While folks are fishing for info on the old times... who can recall a lodge called Yeti, somewhere near the base of Inter.. up from the old Gebis... it was primarily used by RAAF members and families. Stayed there a few times. 1970s. Yeti rings a bell but can't quite place it relative to Gebi's. Did it go when the Sundance was built? SNOW holidaymakers celebrating the ski season opening this weekend might want to spare a thought for a long gone timber building. Skyline Ski Club Lodge deserves pondering, because when it opened in 1947 it was the first accommodation at Falls Creek for snow sport devotees. “It was the start of the village, effectively, for visitors,” Falls Creek Museum curator Karen Smythe says. There was an air of secrecy surrounding the building of the lodge which occurred at the time the Kiewa hydro-electric scheme was being built. 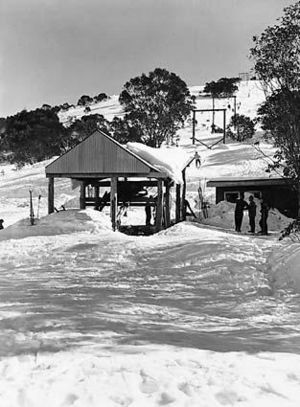 Hydro chief HHC Williams had frozen past skiers’ plans, so six SEC workers covertly coined the lodge with one of them, chief surveyor Ray Meyer, obtaining a 99-year lease from a titles office in Melbourne. His son John Meyer said his family lived at Bogong Village, built for the hydro scheme workers, from 1947 to 1953. “The Skyline really broke the ice, there was a resistance to a lodge being built before then,” Mr Meyer said. The lodge featured a kitchen, toilet, shower and two bedrooms with bunk beds. Construction was done at night and on weekends with the name coming from one of the workers proclaiming: “This is my favorite skyline”. Palatial: The revamped Astra Lodge which will have a grand opening this weekend as part of the ski season beginning. With the development of the International Poma in the 1970s, the Skyline lodge, which was sited between the ski-lift’s pole one and two, was demolished. Today, Mrs Smythe says, its location can only be determined in summer time by the distinct flat bed of land it occupied. However, Skyline’s legacy is reflected in the 5500 rooms of accommodation which have bloomed on Falls Creek in the 70 years since. Balcony spas, saunas and televisions in every bedroom show how lodging has gone from simple to sophisticated. Astra Lodge, which last year was named Australia’s best boutique ski lodge, will have its latest extension unveiled as part of this weekend’s opening. Radio character HG Nelson will emcee and former Cold Chisel guitarist Ian Moss will entertain guests. Compare and contrast: The living area of the Astra Lodge is much more spacious than the Skyline lodge which kickstarted staying on the mountain for skiing. Among the fanfare, the resort’s history will be remembered with funds from an auction to go towards the Falls Creek Museum. Mrs Smythe is delighted by that move and notes the museum features picture boards telling the story of Skyline. A commemoration of the 70th anniversary, including the possible unveiling of a plaque, will be held at Falls Creek on August 12. BillyKidd, JodiRockliff, DbSki and 1 other person like this. This finally gels wth my recollections. 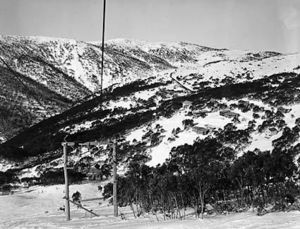 Thanks @Bogong "... Skyline Lodge eventually passed to the RAAF ski club before being demolished." Bogong, sadly, hasn't been on here for 3 years and 30 weeks according to his profile. Doesnt mean I cannot thank him. I was aware. I read Dad your message and he was the Postmaster, Telephone Operator and the Sheriff of Falls Creek when it belonged to State Electricity Trust. So more than likely you were drinking with my Dad while he played on the pianola that his Mother, my Grandmother gave to him. Bob did have Four Seasons lodge for a very long time. Son Eric was there on and off and Bob's former wife has written in these forums over the last 3 or 4 years. I'm pretty sure Skyline/Yeti didn't make to the seventies. The Inter. Poma was built for 1969 but we didn't operate it until 1970. If the lodge was in the liftline it must have gone by then. But I do remember being told that one of the other clubs salvaged some of the timber.....so maybe some of that piece of history lives on? As do some of us.....Gerard Paviet, employed by Bill Bridgeford from La Plagne in France, and I worked together for Alpine in 70/72....we last met in France over forty years ago......and he and his wife are coming to stay with us tomorrow. More nostalgia is forecast! Scott No Mates, BillyKidd and Apresski like this. Yes, I was right, much nostalgia! Poor Elaine, Gerard's wife as we rattled though memories of 1970 Falls - literally down to the nuts and bolts we tightened together and concrete we shovelled. Gerard says I'm wrong and that Skyline was still there after the Inter. Poma opened - which means it wasn't actually in the lift line but set back in the trees a little above and to the right. That means it did survive into the 70s. Scott No Mates and VSG like this. BillyKidd, VSG and Chaeron like this. The snow is about that high at the moment in front of Fryers - about 1' from the gutters. Hi all, I’m after a photo of the Eagle Chair when it was orange with the blue POMA graphics. More detail the better. Hoping someone has one in their archives (or Gully chair as I remember it was originally the same colour/graphics used). Thanks in advance. dibl0c, Pademelon, Whiteman and 3 others like this. Mufts, currawong, Kletterer and 1 other person like this. Hi Bogong, My name is Andrew McCallum. Not sure if you are still interested in Ron McCallum, but he is my Dad, and still going well at 94 yrs old. Lives with me now. All you said above was true, and he did manufacture and erect the Sun Valley T-bar and first Gully Chair, although some of the components were Doppelmayr. My brother David and I are about to start interviewing him, mainly about the old Ski-tow days 50s-90s. Should make for interesting reading, and will make it available to the Museum at Falls. My email is bugatti37a@gmail.com if anyone wants to contact us. Sorry to hear about Erik H recently. Scott No Mates Ver 1.1, currawong, teckel and 2 others like this. Stumbled across some old slides taken by my father and scanned to the hard drive, dating from 1959. My father worked on the McKay Ck power station. currawong, Ubiquitous Steve, Apresski and 2 others like this. Good day to all from Bob Hymans's ex-wife. 1.- Bob died on July 7 2007 , which is pretty easy to remember . When I was living in Falls, not only there were no one else, but also there was no road, almost no other constructions : a very small chalet belonging to Mr. Brigdfort (spelling? ), a wooden hut made into a small grocery store during the season run and lived in by Orest and Cecil - Cecil Dobson who before lived with us - and at the botton of the Frying Pan another wooden hut lived in by Skippy and her husband who were running a rope-lift to the top of Frying Pan, and sometime later, also at the bottom of Frying Pan Bernard and Trudy built their chalet. Trudy has been the first woman giving birth (by herself!) to a little boy during the ski season at a time when we were snowed-in, meaning no access in or out .... About a couple of years before Bernard had come to Falls to give a hand to Bob and Trudy (14yrs then) came to help me with my children, Eric being the third one . They were a group of Austrian, Trudy with her parents, her mother and anorher woman as cook for Bob's chalet, her father and his friend Bernard and another guy called Mark among the guys who worked building the "new" chalet .... That's also how Alberto Costa came from Trieste, Italy, to Falls at 19yrs; and somme others guys whom I have forgotten their names unfortunately . I also like to mention that Diana Lodge was built close and across the road from our place by Kevin Shoobridge (spelling?) the chemist from Mount Beauty, and that was just before I returned to Belgium, Europe. I lived in Falls Creek from 1954 to 1959, so most of the photos and stories you are telling are from after I left to go home to my parents . I must admit that after the latest happenings, I have felt great pains and been hurt, although I have been away from Falls for so very long, it is still part of my own life and seeing "all the bull sh... "(excuse the language but there are no other words) people can write, tell, etc, it is very upsetting ! By the way Eric died on 9/9/2018, up around Falls, my daughters have put plates one for Bob, another one for Eric, they are not at the same place . Now excuse my English which no doubt is very poor actually, but not using it and being 87 yrs I cannot do better . Mirou - as I am called in this Forum, which probably I do not use properly, but there again ... ! Pademelon, Apresski, currawong and 3 others like this.